20 backgrounds come in 4 color variations, and 20 in 2 color variations; so you get 120; but you can recolor as you like, of course. 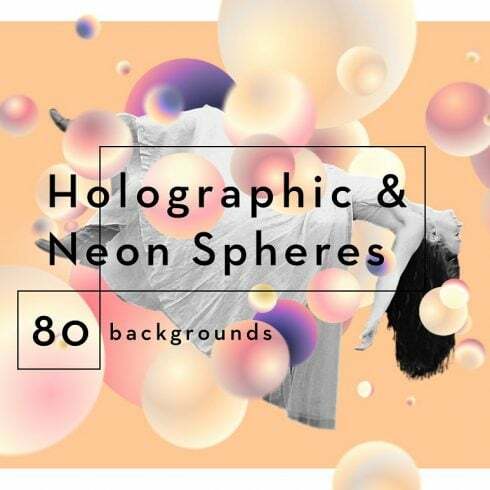 Holographic & Neon Spheres color change in adobe illustrator. from Chris Lemmens on Vimeo. Illustrator files include lots of swatch groups, which makes it very easy to change color. Essentially, textures are graphic patterns that make the illusion of a certain object or finish. As an example, we see plenty of craft paper and wood plank textures in many different designs. Concrete, leather or stone ones are also really common. Textures usually consist of patterns but they look like they are unique and random. The use of textures is not tied to making backgrounds, their qualities can be employed in any interface component. 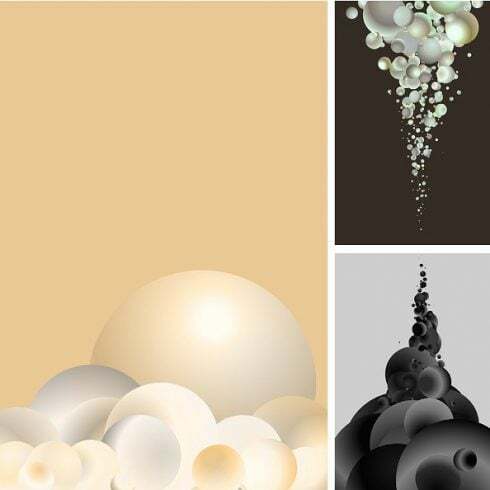 By adding texture vectors, we can create an illusion of certain physical traits, create depth, and make accents. So, who wants a pattern? A pattern is often recognized as canvas that is made up of recurrent pictures. Once we see that a set of design elements is duplicated countless times inside of one layout, we recognize this effect a pattern. Web design patterns are most liked for being light and responsive to different screen resolutions. Using patterns, you can easily compose outstanding vibrant backgrounds and highlight separate elements. Numerous website developers select patterns over full-size photos to create website backgrounds simply because they are highly diverse, eye-catching, and easy to use. Pattern layouts enable you to make vibrant and consistent designs. Normally, patterns and textures are linked to graphic design, along with web and product designs. You can employ these effects to add appeal to any web challenge or artwork. Incorporating a stylish pattern or a detailed texture can absolutely change the feel and look of any design. The costs of textures and patterns vary from four to fifty dollars determined by their complexity and uniqueness. We have the most varied bundles on Masterbundles. They differ in price, so everyone will discover a product to suit their budget. The design bundle is actually a set or selection of items. They’re gathered to a single “box” and are offered together, as one solution. Primarily, there’s some topic or objective that integrates the items within a bundle, but that’s not mandatory. The period, as the design bundle can be purchased, may be very limited (around 5 days) and that’s the key reason why the price tag of it is less than those design items would cost you if marketed individually. Deals are very rewarding and allow developers to save a sufficient amount of bucks. Why patterns and textures are necessary? If you need to have a trendy and attractive layout which will impress the viewer – never try to save money on materials and tools. Quality patterns and textures could make nearly every design excel, for that reason avoid low-quality works. Inadequate color choice or low-res illustrations or photos could mess up the appearance of your project. Some good patterns and textures will show the amount of focus you spend on the details and add you a lot of extra points. Suppose I didn’t locate the design element I need in the bundle? Not every package deal contains things you want which is really common. Product bundles are intended for various purposes and for a different style. Nonetheless, MasterBundles.com website offers a multitude of deals for almost every occasion, so if a specific product bundle doesn’t provide all the products you want – you are welcome to check the other bundles. There are so many of them, that it’s almost sure you will find something fitting. Can I acquire any additional packages on MasterBundles? MasterBundles.com website carries a wide range of textures & patterns bundles, both man-made and natural. Their cost ranges from $4 to $19 and those products are top notch, items created by professionals. Having said that, textures and patterns are not the only design elements MasterBundles.com could offer. You can find bundles of fonts, ebooks, icons, illustrations and mockups, and numerous other stuff. You might even acquire website templates on MasterBundles.com for a less expensive price! MasterBundles.com is an online marketplace. On our resource, professional graphic designers market their creations at the best prices. We provide you with the best design bundles out there, and our bundles are well praised by buyers. Have a look at our blog, it really is loaded with practical material for pro graphic designers. Also, if you subscribe to our newsletter, you will be the first to know about our special discounts. And we love discounts. There will always be discount coupons and promotional codes available to cut the prices to a minimum.